The United States Census data reveal that while the population of Camden County grew by 1.2 percent between 1990 and 2000, the population of each of the three communities in the study area decreased between 1990 and 2000. The census data also reveal that the percentage of minorities living in Bellmawr, Mt. 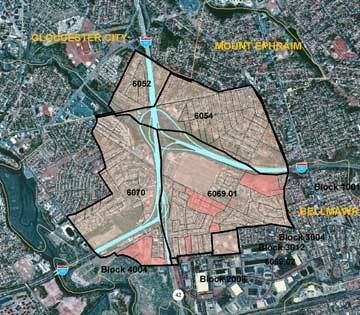 Ephraim and Gloucester City is significantly below that found countywide. The percentage of non-whites in the three communities ranges from 7.2 percent in Bellmawr to 2.5 percent in Mt. Ephraim. Countywide, the non-white population comprises 29.1 percent of the total population. The census data reveal that in the year 2000, the study area did not include any census tracts or census block groups characterized by a disadvantaged minority population, as defined by the Council of Environmental Quality. The file listed above is in Portable Document Format (PDF). You will need Adobe Acrobat Reader to view these files, which is available at our state Adobe Access page.